1. Clean and wash the dals. 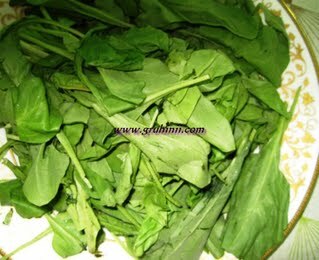 Clean and wash spinach, drain and chop finely. Chop onion to slices. 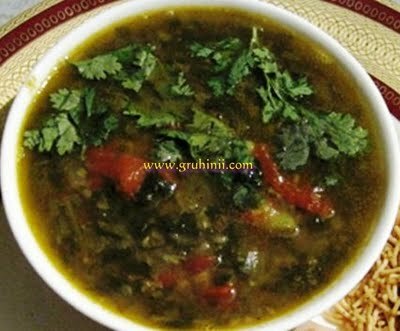 Now cook the dals, spinach and onions in a pressure cooker till 3 whistles. 2. Take 2-3 tsp of oil in a pan and add cumin seeds, mustard seeds, ginger-garlic paste and onions and fry till the onions turn golden brown. 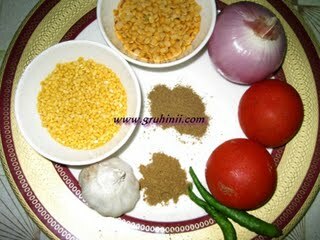 Then add garam masala, dhaniya powder, red chili powder, turmeric powder and finally add tomato pieces. 3. 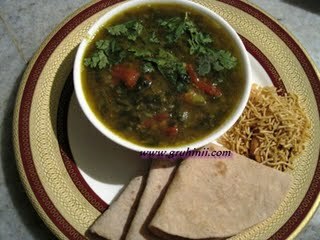 To it add the boiled dal, onions and spinach. Add ½ glass water and bring to a boil.